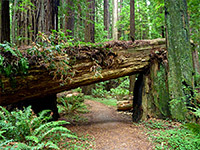 There are two NPS units in California containing old growth giant redwoods (Muir Woods, Redwood National Park) and also around 20 smaller redwood areas protected as state parks or state natural reserves, the majority not much visited. The trees are found beside the northern coast or up to 30 miles inland, generally on the floor of steep sided valleys, always very close to a river or permanent stream. 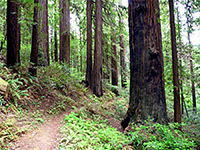 Such is the case for Grizzly Creek Redwoods State Park, which comprises two sites along the Van Duzen River, 12 miles southeast of Fortuna, and five miles north of the much better known Humboldt Redwoods State Park. The river valley is followed by the lightly travelled Hwy 36, which passes very few towns for the 137 mile journey all across the coastal mountains, and leads eventually to Red Bluff in the Central Valley. 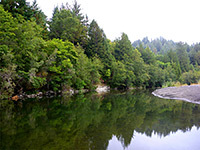 The redwoods grow where the river is still relatively wide, and the waters slow-moving. The western section, Owen R Cheatham Grove, contains the best trees, situated on a flat alluvial plain beside the river, mixed with ferns and sorrel, and toured by a 0.7 mile loop. All park facilities though are in the eastern section, 4 miles away - here are found a small campground, a staffed visitor center (with payphone) and five short trails, generally along more sloping terrain, where the trees are somewhat smaller. Approaching Cheatham Grove from the west, Hwy 36 from Fortuna crosses farmland for the first few miles, past the little settlements of Hydesville and Carlotta, then enters the coniferous forest. The regular sized pines are mixed with a scattering of large, moss-covered stumps from long-ago-felled redwoods, and after a couple more miles, living redwoods appear. The trees grow close together and have dark-colored bark so the surroundings are often rather gloomy. Three groves are contained within Van Duzen County Park, though most of the best trees here are right beside two campgrounds. In contrast, the Cheatham Grove of Grizzly Creek Redwoods State Park, which adjoins Van Duzen on the east side, is completely undeveloped. A sign indicates a very short track that descends slightly to a parking area, on the north side of the road right next to the highway bridge over the river. A little path leads west to the water, which usually flows only along a narrow corridor within the 400 foot wide valley, while the main trail heads north into the redwood forest. A few sectioned logs are displayed at the start of the Cheatham Grove Trail, which soon splits. The left branch crosses the flat forest floor, fairly near the north edge of the grove, passing many tall trees with big ferns and smooth patches of redwood sorrel growing abundantly in between. The majority of the redwoods are similar in size and girth, and only very few have fallen - the grove lacks the great mass of downed trees in various states of decomposition that characterize other areas such as Prairie Creek, so the place presents a very pristine, regular appearance, the calmness only slightly spoilt by traffic noise, faintly audible along most of the loop. A few spur trails reach specific trees, a short distance off the main path. The forest at the far end the loop, closer to the river, is more overgrown, the redwoods mixed with bushes and other species of tree. A junction beside one of the few really large fallen trees leads to another very short loop. The path then returns to the trailhead, closer to the road and so somewhat noisier. The main point of interest on this stretch is a tree bridge, formed by a thick fallen trunk lying on top of an equally large stump. The bridge features very briefly, along with other locations in the grove, in the 1983 film Return of the Jedi. 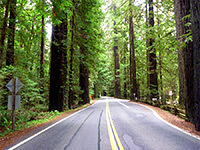 The main section of Grizzly Creek Redwoods State Park is 4 miles east of the Cheatham Grove, and is similar in size, extending just one mile along Hwy 36. 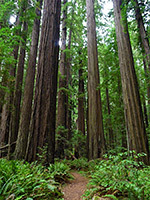 There are eight named redwood groves, four on each side of the Van Duzen River. $8 is charged for parking in the lot beside the campground/ranger station though there is no fee for parking on nearby verges. The river at this point runs south of the road, on the far side of the lightly-used, 28-site campground, and the valley floor is relatively narrow, hence the best redwoods are found only in a thin band close to the river. There are five trails, all short and easy. The Grizzly Creek Trail climbs above the old growth redwoods beside the road, comes close to and somewhat above the eponymous creek, ascending quite steeply for a short time via old stairs, then turns away from the stream and connects with the upper section of the Hikers Trail, which proceeds eastwards through more mixed forest with only small redwoods to the Nature Trail, where aged notices identify some of the plant species on route. This path soon descends to the road, back amongst the bigger trees and reaches another junction, with the lower section of the Hikers Trail; this continues west, returning to the start of the Grizzly Creek Trail. Two other routes are the 1.4 mile (loop) Memorial Trail on the south side of the river, accessed by a seasonal footbridge, and passing a few large trees but not nothing very spectacular, while the 0.4 mile (one way) Fisher Wouk Trail runs between the road and the river on the west side of the park and encounters perhaps the best trees in this area, though all are close to the highway and so affected by traffic noise.